Withstands high pressure - making it perfect for the office. The ATOM 3.0 is equally at home when worn with wetsuit or a three-piece suit. Don't be deceived by its small size -- this small format PDC powerhouse delivers all the bells and whistles you can imagine at the touch of a button. 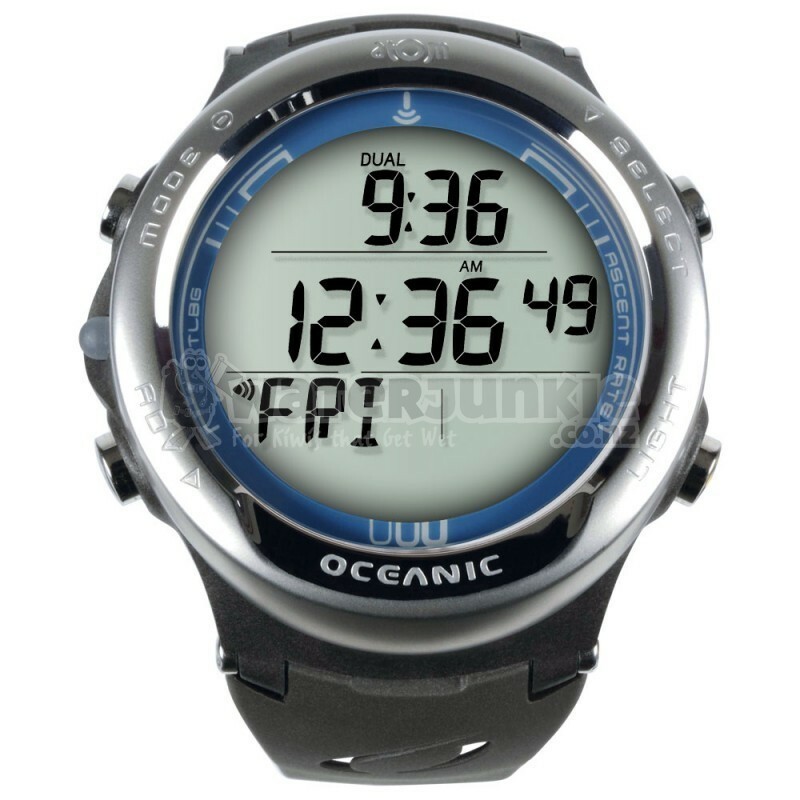 Switch Between 3 Independent Wireless Transmitters and Nitrox mixes underwater The ATOM 3.0 Wristwatch PDC is a sophisticated Personal Dive Computer featuring Oceanic's wireless air integration technology. A transmitter threaded into the first stage high-pressure port continuously sends cylinder pressure data to the wristwatch. Frequencies are individually coded to allow multiple divers to swim side by side without interference with other units, as well as allow advanced divers to monitor up to 3 independent cylinders and nitrox mixes (up to 100% oxygen). Because the transmitter and display module are independent and separately powered units, the receiver may also be easily used as a stand alone, non-air integrated dive computer. Buddy Pressure Check Transmitters may be programmed for "SELF" or "BUD" for Buddy - when programmed for "BUD" - the ATOM 3.0 will search for and display pressure for transmitters that are within range (4-6 feet). Advanced Free Dive Mode The ATOM 3.0 provides accurate depth and time with an amazing 1-second sampling rate for subsequent PC download and analysis. 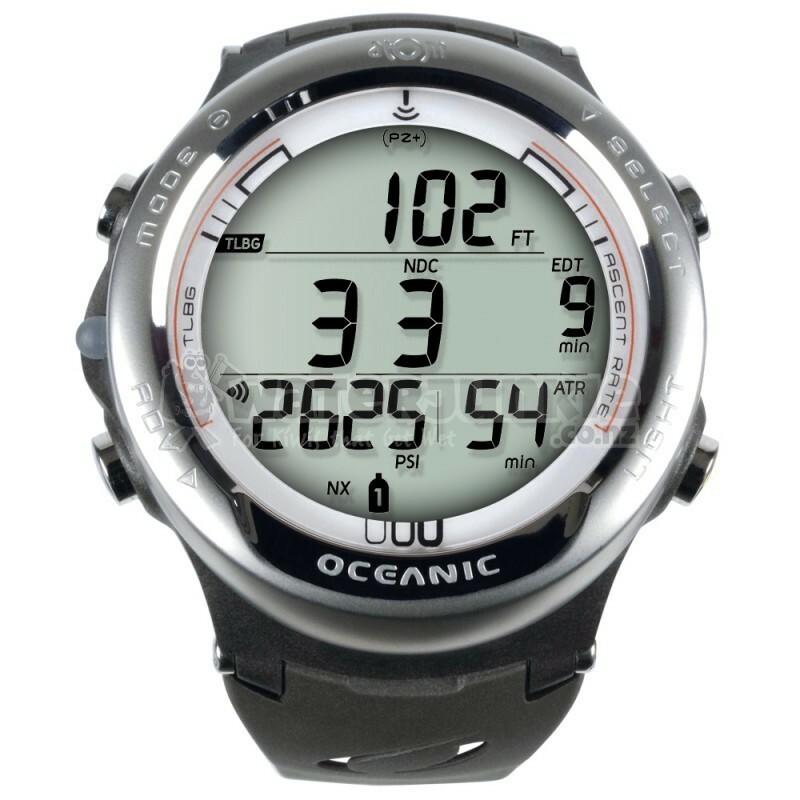 Dive Time is displayed in seconds and minutes. Custom audible alarms include Elapsed Dive Time, Countdown Ti mer and (3) Independent Max Depth Alarms. The ATOM 3.0 is the first Free Diving Computer to calculate and track Nitrogen Tissue Loading, allowing you to switch between SCUBA dives and Free Dives on the same dive day. Advanced Wristwatch Functions The ATOM 3.0 is an advanced digital wristwatch featuring a 1/100 second chronograph (stopwatch) with lap timer, 24 hour countdown timer, daily alarm, alternate time zone with date, 12/24 hour clock, and OceanGlo¦ Backlight.